It's great to have a table decoration for Father's Day. But this year, skip the fluffy flower arrangements and decorate the table with something unique, just for Dad. Try some of these special ideas and enjoy planning a terrific Father's Day for all the fathers in your life. For the fisherman or outdoorsman in your family. Make (or order from a florist) a fresh arrangement made only of leaves and greens. Put it in a long low container, and aim for the look of a clump of plants at the bottom of a riverbed. Add rocks and twigs at the base if desired. Next, wire or thread fish-themed holiday ornaments onto some of the greens. You can also glue the ornaments to small sticks (try a kabob skewer). This should look like the fish are swimming underwater. Tip: Place fish all around the arrangement so everyone can see them. If desired, decorate the rest of the table with a few fishing themed accessories. Place a large bowl in the center of your table and fill with Dad's favorite candy. Around the tabletop add sparkles, confetti, or glitter and foil-wrapped candies. Scatter some loose pieces of wrapped candy around the table. Tip: If you need to, fill the bottom of an opaque bowl with styrofoam peanuts (safely sealed inside a plastic bag) to take up some of the extra room before placing the candy on top. Here are more ideas for table decorations for Father's Day. Arrange photos along the length of the table. Two-sided photo frames are nice or try the stand-up wire photo holders. Use color photocopies of your pictures so they can be passed and handled without worry. Fill in the base of the frames with handfuls of sheet moss, Spanish moss, or package shred. Add some hobby items, collections, saved Father's Day cards, or other items that will be conversation starters. Have Dad tell you about "the time when" the photos were taken. Tip: Stretch a length of plastic wrap on the table so the frames or sheet moss won't scratch the table surface. 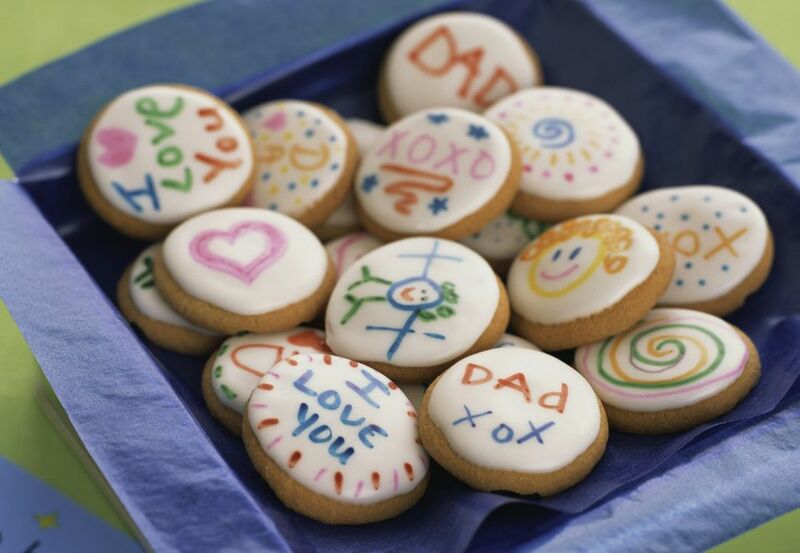 Give the kids several sheets of paper and let them honor dad with drawings and their sweet sentiments. Frame these in inexpensive frames, or set them on small easels down the table. Sprinkle glitter around them to add another festive touch. Tips: Purchase some ready-made art mats in the size you want to use on the table (5x7" is good) -- then give the kids paper that will fit into these mats. Simply tape the artwork into the mat and set inside a frame. Set down the runner in the center of the table. Write up several index cards with hints, clues, or punchlines that will remind family members of funny stories involving Dad. Tie a ribbon to each card, place the cards in the center of the runner, and set each ribbon so it ends up near a place setting. Cover up the cards with some wrapped gifts for Dad as the centerpiece. How-to: Before, during, or after dinner, have each family member draw a card, then read it out loud. Dad or someone else should be designated to "tell the story," making it as funny as possible. Choose one beautiful green plant with trailing branches such as an ivy. Place it in the center of the table (in a basket, cache pot, or even a soup tureen). Insert a few miniature flags into the plant, or use bows made in flag colors and designs. Tip: Decorate the length of the table with mementos of Dad's time in the armed service -- medals, photos, even letters home. Set long flats of sod along the length of your table. (This is best at an outdoor picnic where dirt and moisture won't damage the tabletop.) Place a pair of baby shoes at one end. Next add toddler shoes, teenage sneakers, wingtips, etc. to show the passages in Dad's life along the length of the table. If the inside of the shoes are unattractive, fill with smooth rocks, bark chips, or Spanish moss. At the end, next to the largest pair of Dad's shoes, place a pair of tiny baby shoes, indicating the event of fatherhood. Tips: Adding framed photos will be a fun addition to this table. Use inexpensive plastic holders and color photocopies of your photos. Use trays of sand instead of the sod if desired, or stretch out a length of sheet moss. Use your kids' shoes, or look for graduated sizes of shoes at a thrift store or garage sales. Clean and deodorize them, or the meal will be one to remember for the wrong reasons!